The buzzer of an alarm sounds replicate to that of an ambulance. You awake in the morning of what was supposed to be a good nights rest in bed, only to reach for your back to feel the amount of pain that doubled overnight. There could be a very good explanation for why your are waking up from a very short slept night with agony, or your slept through the whole night but felt lick your just slept on the floor! There must be a good reason for this and to answer the preliminary question of how to sleep with a lower back pain. Bulging disc, degenerative disc, and a herniated disc. 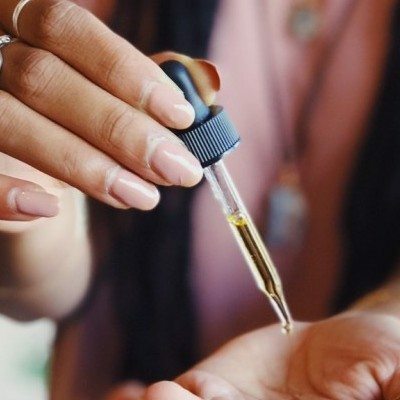 Adding essential oils and CBD oils if need be. …From this to giving you my tips and hefty tricks I use to create and setup the best sleeping environment for myself, and I have a good feeling it can work for you. I feel your pain, how? I doesn’t get any more realistic then me laying in my bed as I’m typing to you, how can i fall asleep with this lower back pain I’m having. Even a true experienced patient like myself still has his off nights. Heck, it’s hard to sleep with lower back pain, and with more than one back pain diagnosis, now that’s more back bone to add to the meat. But you shouldn’t worry so much, take a breathe, after today you’ll be ready to take what you’ve learned and apply it to get through the best night of sleep you’ve had, In my hope. What’s Going On In That Complex Yet Amazing Mind Of Yours? Will The Floor Work For You? What About A New Mattress? You can continue with the Remove Back Pain System by seeing how to use muscle relaxants here. Getting through a restful night was really tough to figure out. I struggled all together for 8 years with constant back pain, when it was not my degenerative disc, it was either my herniated disc that developed, or the constant acute joint and muscle aches that would return over and over and…I think you get the point. It was emotionally draining, taxing. Sleeping with a herniated disc was uncomfortable, and the second worst thing I’ve had to go through(aside from #1, which was getting it). I remember my first night sleeping for just 3 hours before I woke up. I took a painkiller to relieve my pain, and aches. But it was impossible to hold the same sleeping position for another hour. Sleep on my back? impossible, Sleep on my side? Too painful, sleep on my stomach? forget it.No matter the sleep position, I would hurt. So what was the point? 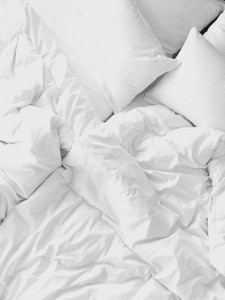 We’ve all read how to sleep with a lower back pain, put a pillow here and there, what mattresses you should get, what pillows to buy, buy this, buy that, get x, y and z…. What if instead of reaching for that wallet of yours, you took a more sub-conscious route? Believe this or not, your psychology is the number one reason you can not sleep at night…no kidding. I also needed a second to process that through when I found out what I was doing wrong. One Tuesday afternoon in the middle of winter back in 2013, I walked into the doctors’ office for a back pain check up. I met with the specialist, and my doctor told me what I needed to do at night. So upon my visit I asked, “is it good for me to posture my body position first than let the rest take its course?” He proceeded to tell me that actually it should start with my brain…hence the psychology. “When you already thought about the pain before your closed your eyes and said goodnight, the tougher it will be to sleep through the night”. Your brain(meta cognition) needs careful nurturing, and you are just not getting enough of this. So lets start with cognitive therapy. This will help treat chronic pain and break down the first wall of defense. If you had insomnia prior, it will also help diminish that. You know what all these emotions have in common? They are determining factors for stress. Your thoughts may be having a direct or even in direct impact on your mind and body. When you are behaving in such a way that your are thinking negative about sleeping, then it will be hard to cope and deal with your pain management. 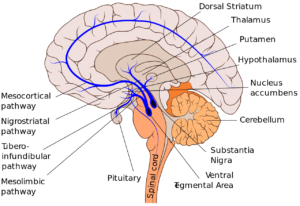 Whenever you feel a shot of pain from your Lumbar up to your brain synapses your automatic response your feel is like a jolt of electricity. Not only does the as the pain goes up to your brain it also comes down. When you react in emotion before thought then you’re taking 2 steps backwards and only taking one forward. If my math serves me right, your are still back one step from your starting point. Just see here how your emotional actions trigger the different parts of your brain. nerves follow down the spinal cord and down the lower back. Then Shoot back up. It is tough to sleep through chronic pain, I can relate. I can tell your that sleeping some nights were in bearable. You know those bands your put around your back to help keep your posture in balance? I slept with one of those, yeah. It did not relive much of the pain, instead it caused my back to stiffen up, leading to more pain. Take a Deep 8-second breath, now release all the way through. Repeat 3 times. Focus on a happy thought. Envision it. Calm your mind by putting away any devices, TV, radio, etc. 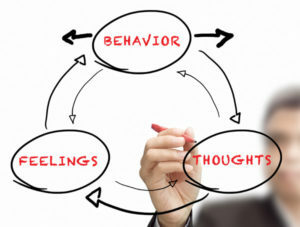 With these steps your can focus better positive thought patterns, and it will prepare your for reaction. You already know your brain is going to receive an impulse from your back, but this time it will not cause worsening pain. Rather, you are in control! Oh Boy! I didn’t think I’d have to repeat the same word twice, especially if I’m not in the high rush of energy coffee brings forward, but that’s what happens when you drink coffee-you accelerate(I had to put down my cup of coffee just an hour ago SERIOUSLY). Guess why I did it? It’s the ultimate no no. You want to learn how to sleep for lower back pain not to hurt your back right? Well knocking off high energy is one of them. Alcohol. Will cause you a bad quality of sleep. Food. Will cause an acid reflux, and will not let your sleep. Medications will cause an implication in your sleep cycle. When you are someone who has a high blood pressure, ADHD, or epilepsy, then your are in risk of having quality sleep. Medication is meant to help your with sleeping patterns, not to put your into doze off mode. I’m against medicine to help yo sleep but if your chronic pain is severe than by all means apply it. These drugs are good for a long nights rest. When you have severe chronic pain these can be an option. For those of your who are in the beginning month stay off of these as good as your can. Look into cognitive control like I mentioned above. Neither Tylenol, nor Advil are a long term solution, so its good not to rely on these. They will help for inflammation but are only a short term use. Popping pills can make your reliant. You might temporarily be relieving your pain but most chronic conditions last for months after it starts and even years and years. Instead, focus on the begging of your day. Combine exercises such as yoga, and a few simply day to day stretches will go a long way in reducing your stress levels. Then by the end of the night your will have a better control of your pain and it will become sub conscious. Learning how to relieve lower back pain while sleeping doesn’t have to be difficult if you can master the art of your sleeping technique. This sleeping pattern might sound familiar…your lay on your stomach with your head on the pillow for support. Great, you’ve supported your head but your left your back exposed. Now, your didn’t account for the extra movements your make throughout the night. Your spine is pushing down by gravity into your abdominal muscles. What if instead of switching your though to getting a new mattress, you slept on a flat surface? You slept on a surface that changes that balance of your body, which changes the way your body-weight is applied. 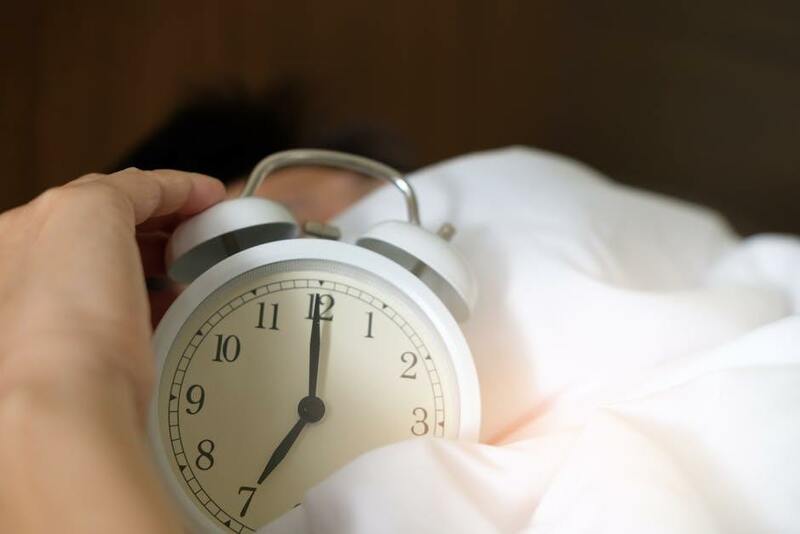 You’re going to sleep at your best when you can put your mind to rest before your body, and once you do, you won’t be asking How to sleep in lower back pain distress, but rather how to make it a nightly routine. I want you to know the #1 setup I use to get a restful night in bed. Once I do, I will continue with explaining the best ways to utilize your own bed for your conditions. I’ve optimized my bedroom for less clutter and more room. My bed held one mattress at one point. A memory foam. And that memory foam was supposed to relieve my back pain, blah blah blah(well, it didn’t work for me). One day, I had an intuition when I got home from school to use my brothers memory foam(his bedroom was next to mine). Little did he know. I paired it together with my other memory foam, side by side. His being slightly higher than mine. I had an idea to rest my head on one memory foam, and rest my upper torso and lower body on the other one, to help my spine. Sadly, it didn’t work! I then thought about using a mattress topper to elevate myself even higher to get relief, and can you guess the results? Guess what?? IT WORKED! Honestly, Thank God. After endless, and a couple of years in tremendous lower back pain, from disc, to muscles, to facet joints, and my lower torso, I found the best sleeping position. I managed to sleep all through the night. I appreciated my mornings even more because it meant I could stay in bed as long as I wanted(with the exception of school and work, but the weekends, I was all game). It’s in the physics. It all makes sense because you need to elevate your center of gravity to pull the mass and weight at an equal level. When you lye on a flat surface, your lower back and pelvis take on just about all the body weight. And unless you have to move, you will be in pain. My setup gives my upper-body all the weight.No chiropractor, physical therapist, or doctor would tell you to sleep this way, but I know for me and a friend who soon tried it, proved not only my theory, but action. And if you’ve ever heard of the McKenzie Method, you’ll understand why this method of sleeping would work. In no way shape or form am I to tell you its never time for a new mattress, because as well as I know, there are tall telling signs its out with the old and in with the new. If my method doesn’t feel long term, then the time has come to place your two hands under your mattress and chuck it deep into the dumpster. I had the above setup for two years, and It worked just fine, but I also had saved up for a new mattress. Remember this saying: “Floor Galore” for this next part. I can’t put up a thorough answer besides to say no, you shouldn’t sleep on the floor. Keep in mind that a hard surface, not only will your spine be taking on all the pressure, but your lower body will stiffen and accumulate all the forces. Don’t you worry if you can’t get the setup like I have been able to do, because you could use the following techniques for your lower back pain to still get a restful night. Degenerative disc. When you have a degenerative disc issue, your vertebrae will not be fully supported, and so your will continuously feel a pinch much faster in your lower back because your body is in a fixed position for so long that a sudden movement would not be able to cushion your vertebrae. 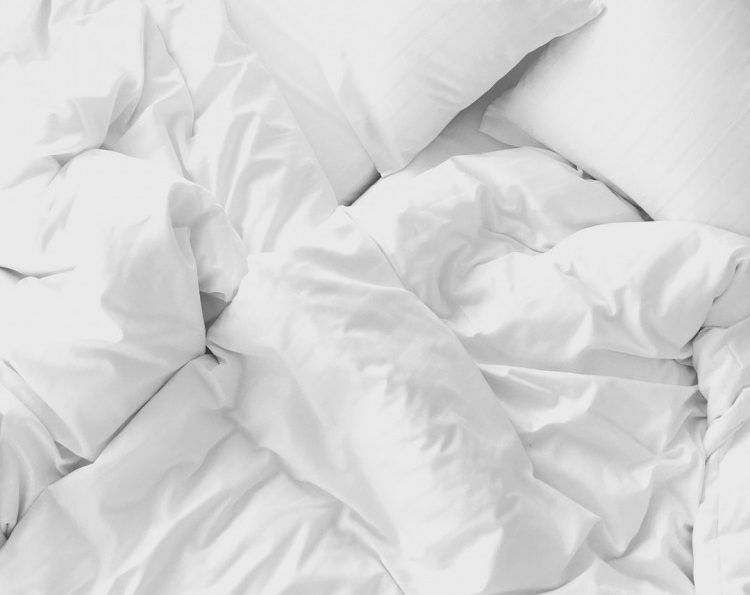 The following will show you how to sleep, and the type of mattress you should be using. Sleeping on your stomach is preferred. It makes sense because it relieves the pressure on your disc space. Sleep on on your side with a pillow between your knees. My chiropractor recommended me to use a firm mattress. To go along with that, I had to place a pillow under my stomach and hips. These two modifications helped relieve the pressure off my disc, and open up the space in my vertebrae, and give my facet joints the relief they needed. 2. Herniated disc. Now if we’re talking about a herniated disc, you can use the same sleeping techniques. When your disc is pushing to the adjacent side of the vertebrae and pressing onto the nerves that’s what will leads to a herniation. First your weight is distributed. Second, you are putting less pressure on your pressure points by widening your body. You should be able to use any of these sleeping positions as your like under any condition. They all work well. Some specialize in either a degenerative disc or a herniated disc, but all together any will work. I highly advise to stick to the ones in their category. 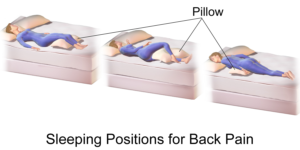 This is important, make sure your alternate opposite sides when your sleep to prevent spinal stenosis. 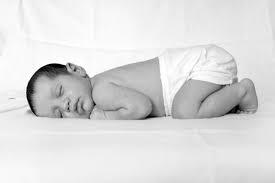 Sleep on your side, with your knees curled up to a fetal position. The reason you should do this is because it will take the pressure off your nerve roots. Like in osteoarthritis, you should take the adjustable bed way, that allows your head and knees to be elevated, keeping pressure off your nerve. If we’re just talking bursitis specifically, any sleep position will be just fine. Bursitis can be aggravated by a mattress that’s too firm. A pillow top mattress will reduce pressure on your hips. Sleep with a pillow under your back, neck, and head to support your body. This will act as if you were on a reclining chair. If this doesn’t work, try adding more support cushioning and so that you find the best elevated position for your knees. Other than that, try the other sleeping positions for the other conditions above, and look at the bottom picture below for a reference. Option #2. Another Thing I find that works well for Sciatica before going to bed is to take a warm bath, NOT a hot one because that will burn your skin and raise your temperature in bed – not allowing you to sleep. If a hot bath is not your thing, you can use different heat therapy methods like a patch or a dry heating pad which is better suited to handle stronger pain. 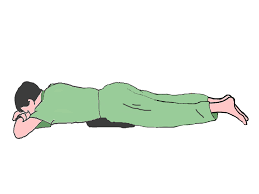 This picture above not only shows how to angle your body position, but how to sleep with a pillow for lower back pain. Make sure to look at them closely. One other note: To sleep at your best, try to stick to the same routine, and if you haven’t yet figured that out, it can take you some trial and error to find what works best. But if you’d like to see a routine I’ve built for you, go ahead and find it here. Are you overdue for a new mattress? It’s quite possible that up to this point you’ve tried everything to get relief, but one thing doesn’t fit…your mattress topper or mattress bed. I’ve always advised, and will continue to say that you should stretch and take muscle relaxers first before putting a blame on your mattress. There’s a way to check if you really do need a new mattress bedseen here. If you don’t know already, the pharmaceutical industry(better known as Big Pharma) is rapidly growing, evolving, and transforming, but not successfully as you might believe. 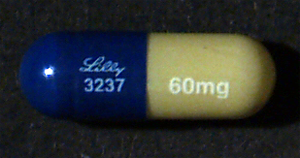 Pharmaceuticals are focused on phrase: “how much money can I make”. Sure, you can gain relief from popping a pill of your favorite NSAID or opioid tablet, but that’s exactly the mindset huge pharma industries want you to take action in. So then, I can ask you, are you profiting off of them, or are they profiting off from you? You profit much little then these power giants do. There will always be another pill to create and revolutionize, but there is only one of you. That can’t be replicated. Alternative medicine is here now, and it will be here to stay. One of these are Essential oils. They have been around for ages! 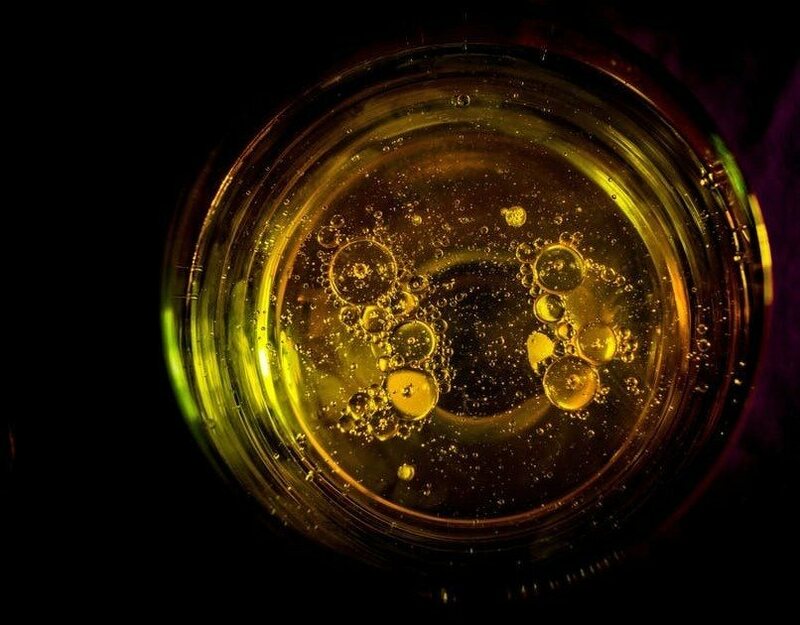 These oils are extracted from their native plant species, and transformed to its oil properties that you are possibly most familiar with. What’s the point? “How do I know If it’s right for me”? You can substitute your NSAID pills and more temporary conservative approaches with these oils, it’s awesome! You can use them while on stronger drugs, but to transition away from opioids, there’s detox, and withdrawals to take into account. If you would like a step-by-step procedure to get off and stay off opioids, you should check out my opioids and 12 day course actile here. Now, for much stronger and constant pain such as chronic lower back pain, you should take a look at CBD’s if nothing else is helping you. In my most agonizing days of pain, I really didn’t think I would ever get a full night of sleep. My lower back was killing me the moment far before I even got to bed. Before purchasing my mattresses, I had some experience with CBD Oil. And so my beliefs on it actually working changed for the better. At last there was a remedy to get off opioids, and at the same time get instant relief. You can find out more about CBD’s with the inclusion of back pain here. Sleeping at night can be made very easy with a few simple steps. will let your get a better nights sleep. If you’d like to get a nightly routine guide that’s worked for years to me, and I know that it can suit you well too, make sure to check out my day to day management guide and how to take care of your back morning to night here. When you have any concerns, questions, or want to offer up your opinion, I would love to hear from your. There might be something your are doing different from from what I know, and I can learn from your own experience. . I will get back to your right away! Till this point, we’ve tackled in my articles and within the Remove Back Pain System segment that exercising, eating right, and cognitive thinking are very important for your back pain, but we’re missing one key ingredient, talking about your natural remedies. I totally don’t want to freak out right now. I can’t wait to ask. I’ve been having back pain and i wake up with it constantly. But it’s at my upper back. I also wake up with pains in my neck and hand sometimes when i position my hand in a way while sleeping. I thought it was normal but right now i’m trying not to be worried! I also feel pain because i can’t sit straight and bend my back whan i sit on my beg or a backless chair. I feel the pain right now as i type. First I’d like to start off by saying, there is a reason for everything, and you are in great hands Jey. This is a common issue I hear, and am no stranger too. I have left you an email as you have asked, hopefully you can find the time soon to read it. 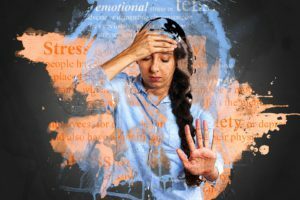 The best course of action is remaining calm, and knowing your responsive actions.I discussed how the symptoms can be coming from a possible muscle strain, ruptured disc, ankylosing spondylitis, shumermans, or just constant stress. Can’t wait to hear from you back my friend. Informative post Michael , I had chronic lower back pain for over 4 years and agree that positive thoughts are a big part of getting through pain recovery , I stopped taking pain pills after atour 6 months and my go to remedy was laying on the floor with my lower legs elevated on a foot stool , i also went through many containers of Tiger balm a rub I got a a Chinese store down the way from me .. happy to say I have fully recovered now and can sympathize with anyone with back pain . 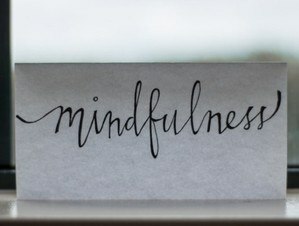 A positive mindset will help not only ease the pain but actually make it go away much sooner. No way? I haven’t tried that way out yet, but I have against a wall, similar but less height on a wall. I’m glad you found relief by laying on the floor Instead of choosing to go with pain meds. I like tiger balm, have used it various times and it does a good job. I’m really happy to hear your story, glad you’re better. Thank you! More. Unfortunately, I do not at the moment. I do help out some friends and family from time to time when I find the chance to and it’s of a serious use. I hope this helped, please let me know if you have further questions. Thank you! Great tips. My lower spinal is slightly misaligned (I’m not sure what’s the term), but according to the chiropractor, it could lead to slip disc, so I guess it’s pretty serious. I’m going to try inserting a pillow between my knees and see if it helps to ease the nagging pain off. Thanks. The term you are looking for is a spinal misalignment. Yes this tweak can lead into a slipped disc really quickly, as it’s only a matter of a couple of twist, turns, or bends to get you to get a disc out of its space. This will take the edge off at night, and allow for all your lower back muscles to be in alignment with that of your spine. The most appropriate course of action would be to start working on your posture immediately. You can learn more about it here . Please let me know if there is anything else I can do to be of help. Thank you! I really enjoyed reading your article. I have really bad lower back pain, and I can’t get any sleep at night! I’ve tried pills, some relief creams and nothing seems to work. I’m grateful that I landed on your page because now I know exactly what I haven’t tried and what I will need to do now. What really grabbed my attention was the structure of your page, you go from insomnia to relaxing, and all the sleeping positions for different conditions. Thank you, and can’t wait to hear more. I’m sorry to hear that! Sleeping and lower back pain more than half of the time do not mix well together. It really is about finding the best ground formula, and then working your way yup from there. Oh really? It’s not surprising that drugs and all relief creams didn’t work, after all there purpose is to mask away your pain for a short coming and then come back right away. I do recommend a pain relief cream that will get to the root of the cause and help drive away inflammation, but there are very few. One of these goes by the name of Penetrex. What penetrex has are essential oils and herbs mixed together, and if you know a thing or two about these two remedies, they are extremely helpful in driving away inflammation, stress, and muscles aches and pains. I always like starting off with the information that you shouldn’t do, or information that builds the negative to the positive. This way you can see the things not to do, and try to steer away from. Every back condition has its ways of relaxing and sleeping, so it’s important that I make that loudly known. Thank you very much!